With the ever-rising concerns about safety and crime, the demand for dependable home security systems is at an all-time high. Statistics show that homes protected with even the most basic security systems are about a third as likely to be burglarized or robbed as unprotected homes and those that are broken into often tend to have much smaller losses. The advent of home electronic security has led to cheaper and more secure security devices that makes it easy for homeowners to be home’ even when they are halfway around the world. If you are a first-time buyer looking to invest in a home security system, there is a lot you need to learn even before you can go out and shop for the devices. This post is a summary of where to start. What this means is: will your home security system be linked to a central monitoring and emergency response office or will it simply have an alarm mounted on the house? Monitored Security: There are countless security companies that charge a small monthly fee to dedicate a team to monitoring the goings and comings of your property. These companies often install their own security systems and may charge for installation and any upgrades. A monitored security system may have an active visual monitoring or simply respond to alarms. Businesses and homes with high value property typically choose this type of security because they will be contacted in person any time there is suspicious activity in the home or when the alarm is tripped. Unmonitored Security: If you would rather be notified when there is a potential intruder into your home, and you would rather not incur any recurring security charges, this is what you need. Fully-loaded home security systems are sold at amazingly low prices today and you can grab one and even install it yourself. These systems even offer the option to monitor your property over the internet and dial the police when the alarm goes off. 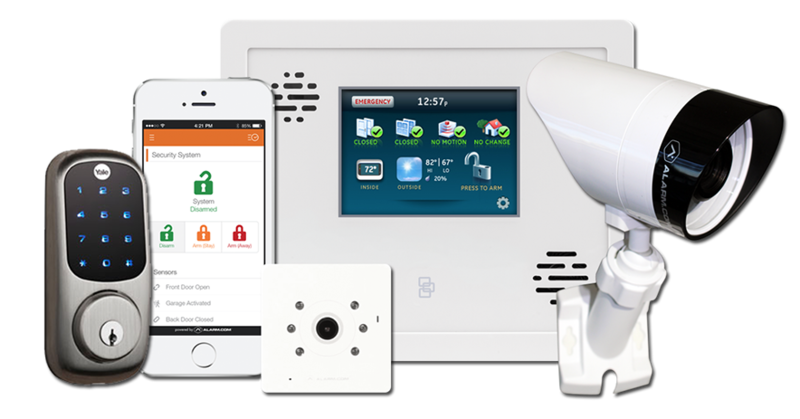 A full home security kit may include a sound alarm, exterior security lights, IP cameras, and power backup systems. While shopping for a home security system, wired vs wireless systems is more about where sensors are placed in the home than how they communicate with the control unit. Wired security system: In this system, low-voltage wires are routed discretely throughout the house to various detectors, sensors, and other devices such as security lights control. While they have a limited range, wired systems are popular because they are more reliable and are much cheaper than wireless systems. Wireless security system: The security components in a wireless home security system have tiny radio transmitters that send signals to the central control unit. Wireless cameras that connect to the home’s wi-fi system and hidden IR tripwire components are good examples. The best thing about these systems is that they are very easy to install and often have backup batteries that kick if power fails or when intruders cut power to the property. Generally speaking, the efficiency and reliability of the home alarm equipment you buy will largely depend on your budget. As with everything else, the latest and most dependable equipment is the costliest and if you would rather hire a professional company to handle the installation, you will rest easy knowing that it was done right but it will cost you. -A hidden control panel with an external power source. The control panel is the brain of the system and controls all the other components as well as the alarm. It may be connected to the telephone line or have other communication options such as cellular connectivity. -A PIR or Passive Infrared detectors, also known as motion detectors, detect changes in infrared energy to detect motion and body heat. These will be mounted on walls, over doors and windows, or even outside on the fence or yard. Installers should be certified by your state or the National Burglar & Fire Alarm Association. -Audio and video detection equipment. Discrete cameras and audio discriminators that convert acoustic shock waves (e.g. Glass break sounds) into electrical signals are sold for cheap today. They are a must-have for any modern home security system. -Remote control to disarm the system without the need to punch in security codes every time. This is also handy for disarming false alarms. Modern systems use NFC (Near Field technology) that are hidden in keyrings, phones, or inside the car to identify members of the family. -Sirens. These may be in the form of horns, bells, or strobe lights. They should be loud and visible enough to draw the attention of the neighborhood when an intrusion is detected and to scare the intruders away. There is a lot more and very specific information you would still need to know about modern alarm systems to know what is right for you. By now, you should have the general idea of what to center in on as you research further.